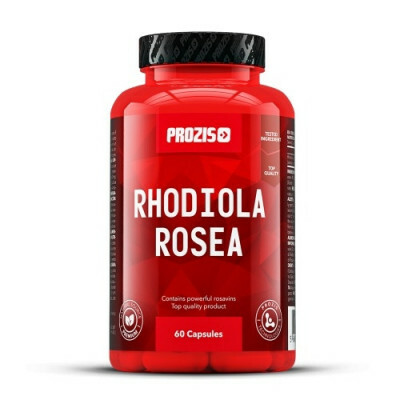 Prozis Rhodiola Rosea 400mg enhances your physical and your mental performance at the same time. Rhodiola rosea is a plant mainly found at high altitudes, in the north of Europe and in Asia. Tradicional medicine has been using the powdered root of this plant for thousands of years, using it as a general health tonic and to treat many disorders. Rhodiola rosea has been traditionally used to improve physical performance, and it is a very popular energizing herb in many parts of the world. New research established that it enhances endurance in athletes, while decreasing their physical fatigue at the same time. In a recent study, scientists compared measurements of strength and of the time by which athletes reached exhaustion. One group of individuals was supplemented with Rhodiola extract, while the test group took a placebo. The results were clear: subjects who took the herbal supplement experienced significantly improved strength and exercise endurance compared to those who merely took the placebo. Rhodiola rosea is composed of several natural elements with biological activity, such as flavonoids. Flavonoids are potent antioxidants that remove potentially harmful free radicals from the body. Free radicals are by-products of digestion and metabolization that may harm cells by damaging their membranes or their DNA. By consuming foods rich in flavonoids, you benefit from their protective action, which reduces oxidative damage to the cells, improving your overall health. This action has visible effects on several cell structures, like the skin, that becomes stronger and more beautiful when it is free from oxidative damage. This antioxidant effect can also prevent several types of cancer and other health conditions. Dopamine and serotonin are neurotransmitters that take a fundamental part in our brain functions. However, dopamine and serotonin can be broken down by enzymes that naturally occur in our body. Rhodiola inhibits these enzymes from damaging the body's neurotransmitters, enhancing the levels of these compounds, relieving depression, and promoting a sense of general well-being. Rhodiola also improves blood circulation in the brain and promotes more rapid movement of neurotransmitters into nerve cells, which improves alertness and mental performance, and reduces mental fatigue. Rhodiola Rosea 400mg, by Prozis, will help you surpass your own physical limits, making you more intellectually active and mentally focused at the same time. Kasutamisjuhend Take 1 capsule 1-2 times a day.